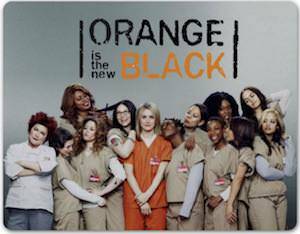 Now your desk can have a Orange Is The New Black cast mousepad. The mousepad is just made for the desk at home or work and this one shows the cast of the Orange Is The New Black Netflix series and the logo of the show above them. And if this is not the one your like then your are in luck, just click the picture to see other Orange Is The New Black mousepads. A mousepad is just fun to have on your desk even if you don’t use a computer mouse anymore as it does add something you like to your boring desk. Now there is a Daryl Dixon addiction mousepad for the true fans of The Walking Dead. 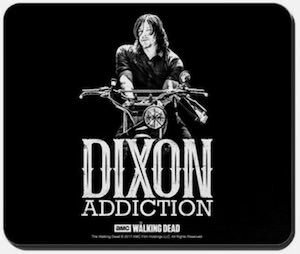 The Walking Dead mousepad is black and on it you can find Daryl Dixon on a motorbike and below that they text “Dixon Addiction” and even The Walking Dead logo from AMC. 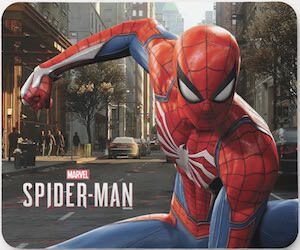 The Dixon addiction mousepad is 9.25 x 7.75 inches and has a nonslip back so that it keeps in place even if you are doing some heavy duty gaming. 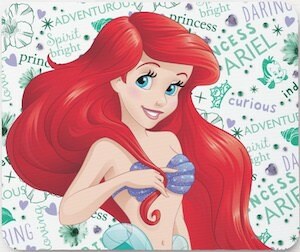 And if the Daryl Dixon mousepad would get dirty then it is good to know that it is machine washable. So give your mouse a nice clean surface at home or the office and everyone that will see you use this mousepad will now really know how much you like The Walking Dead. If you need a good mousepad for long time of mouse work then check out this Batman gel mousepad. The Batman mousepad is black and has a gel palm rest to get the perfect angle for your hand and the mouse. 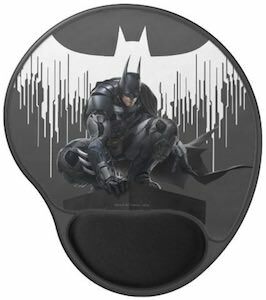 On the black mousepad you can find the Batman logo in the background in white and it seems to be dripping and then there is Batman sitting kneeled down watching over the world. Mousepads are great but often they are not made to make you have the perfect hand, wrist position and that is why you should out this gel mousepad. If you like Superman and need a mousepad then you just need this Superman Man Of Steel mousepad. 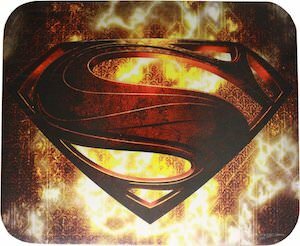 The mousepad is 8.5 x 7 inches and shows the famous Superman logo as used for the Man Of Steel movie and it is surrounded by fire. So now your desk at home or the office can look a lot nicer just because of Superman and even if you don’t use a mouse anymore the mousepad just look nice and you could use it for other things maybe as a coaster if you like too. Now the Man Of Steel can be with you when ever you are at your desk because this mousepad is here to stay. If you like Baymax then you should check out this Baymax Big Hero 6 mousepad. 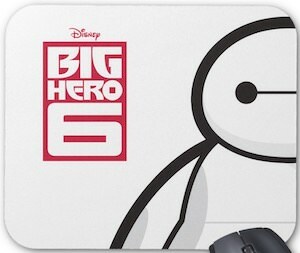 The mousepad is white on top with on the side you can see a big part of Baymax and next to him a big red Big Hero 6 logo. The Big Hero 6 mousepad is 9.25 x 7.75 inches and has a nonslip back so that it stays in place when you are using it. So now you can have a really cool mousepad on your desk at home or the office and having a Baymax mousepad is great as it makes it easier to use your mouse and will keep it cleaner too so that it works better. 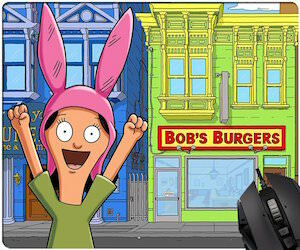 Now you can have a Bob’s Burgers mousepad that shows the restaurant and Louise. Louise Belcher is everyone’s favorite just because of her can-do attitude and she is cheering you on if you get this mousepad. On this mousepad, you can see the street where the Bob’s Burgers restaurant is at and in front of all that you can see Louise cheering you on. The Bob’s Burgers mousepad is 1/8″ thick and has a non-slip back making it great for work and gaming and if you don’t use a mouse anymore then this mousepad can just be a great piece of desk decoration. Fans of Sons Of Anarchy that have a mouse on their computer really stop what they are doing and get ready to order this mousepad. 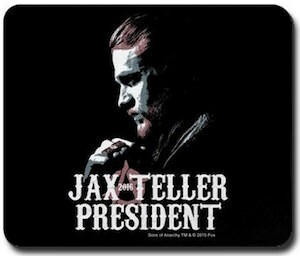 This black mousepad shows a picture of Jax Teller from the side and he seem to be thinking of a new plan. Below Jackson it says “Jax Teller President” and it also has the Anarchy A on the mousepad to. 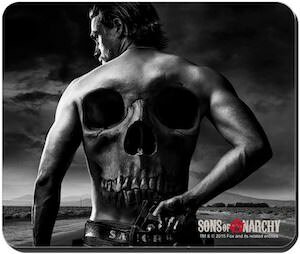 This Sons Of Anarchy mousepad is 9.25 x 7.75 inch and has a cloth top and rubber back and is perfect for even optical mice. And if you mousepad gets dirty then no worries just put it in the washing machine as it is machine washable.